June Long weekend – June 11th, 12th & 13th. Saturday & Sunday 9.30 a.m. to 5.00 p.m.
Greyhound Park, Cardigan Street, ANGLE PARK, S.A. which can be accessed from Hanson Road or South Road. 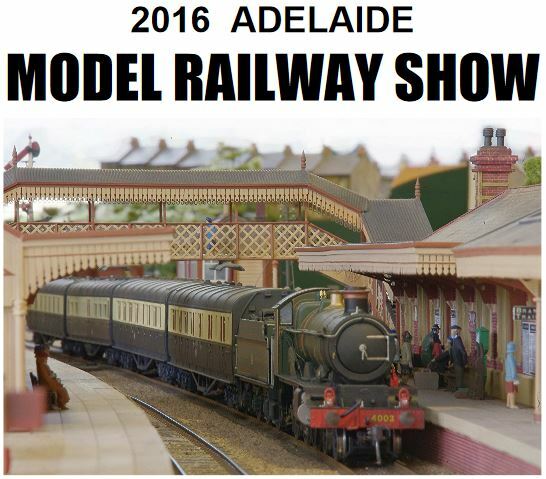 Once again, seven of Adelaide’s model railway clubs have combined to present the Adelaide Model Railway Show over the Queen’s Birthday Long week-end. Admission, which includes a souvenir exhibition guide book is,Adults $14.00; Concession $12; Children $6.50; Families $32. Children under 5, free (the family ticket represents excellent value as it admits 2 Adults & up to 4 children). There is plenty of free parking at the venue and easy access for the disabled. Light refreshments are available inside the venue and there is plenty of seating for those who need to rest their legs There is a tavern next door for those in need of more substantial refreshment! Over 30 train layouts will be on display this year in all the popular scales, and will be a blend of old favourites (some substantially modified) and brand new layouts, including a number from interstate. There will also be trains that the children can operate and modelling demonstrations. By voting for the display they like the best, each visitor is entered into a free Draw for a chance to win a train Set donated by Junction Models on Main North Road, Enfield. There will be plenty of support from the Model trade with both new and second-hand trains and accessories for sale, together with books, videotapes and D.V.D.s. There is free face painting for the children. This will be the 30th show, and so far $171,000 has been raised for various charities. The beneficiary this year will be the Make A Wish Foundation. The major sponsor this year is the City of Port Adelaide Enfield. For updates and information on the show, including a location map, checkout the website, www.modelrailwayshow.org.au or telephone (08) 344 6939.